Cooler trading heads – algos- surely prevailed last week as the market rebounded. Arguably, there may be some options expirations related reasons for the rally. Thus, what happens in the days ahead will be just as important as last week’s bounce in stocks. 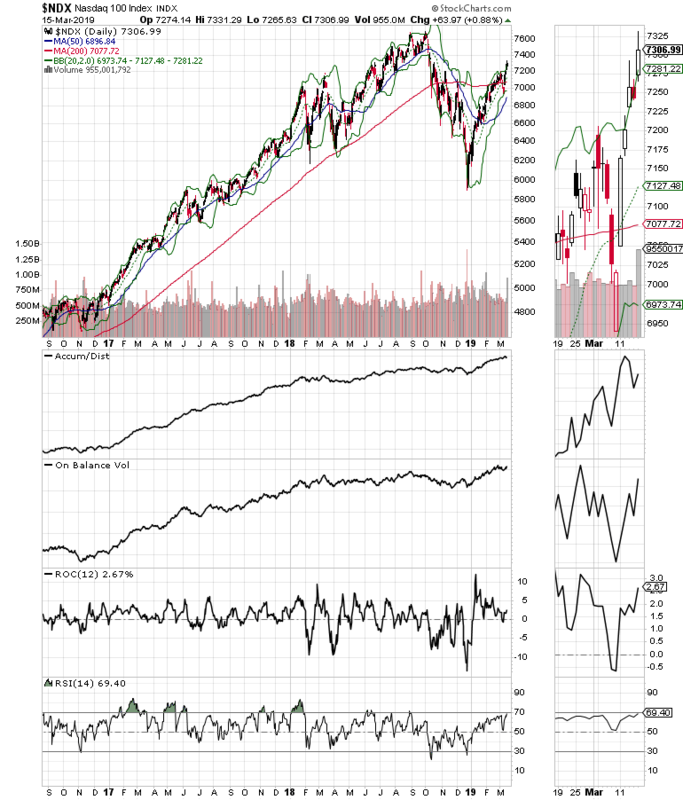 Thus, I was not surprised to see the S & P 500 (SPX) bounce back after the four day, three percent decline from the past week while the NYSE Advance Decline line (NYAD) – see below for more details – made a new high, suggesting that the short term trend has turned to the up side for now. Of course, things may reverse again in the next few days or weeks. After all, this remains a headline triggered robot algorithm guided market. My point, however, is that from a very macro standpoint, despite the volatility we may see from time to time, this market is still responding to the notion that interest rates won’t be rising anytime soon and that the U.S.-China trade talks have not broken down. Of course, the market is hoping that the trade talks will turn out to be very positive and that the global economy will respond to lower interest rates and a trade fix. Both points are definitely arguable, although not in this forum. Calendar : The Federal Reserve meets as does the Bank of England. Europe and the U.S. will release PMI data while the U.S. will see regional Federal Reserve district data out of Philadelphia. Another Brexit vote is expected. Big Picture : The third year of the Presidential Cycle (2019) is traditionally bullish for stocks. But seasonality alone can’t hold up stocks if central banks don’t respond to conditions quickly enough and if the global economy does not respond to lower interest rates or accommodative monetary policy as it materializes. Risk : Headline risk remains. Think U.S.-China trade war, global tariffs, slowing economic data, politics. Of the four, it seems politics is starting to get near some sort of boiling point. Market Behavior : Volatility is likely to depend on headlines. Expect swift and until proven otherwise shallow pullbacks with buying of the dips. 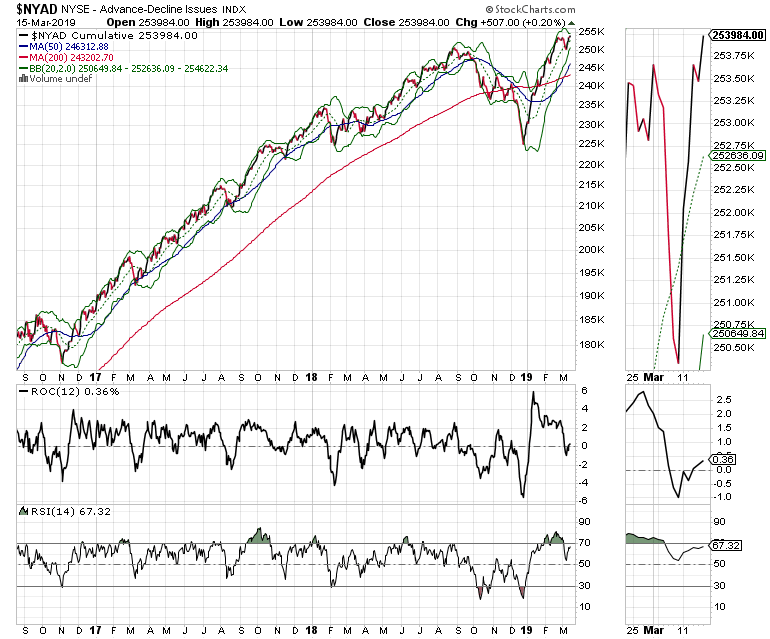 It’s hard to be bearish when the New York Stock Exchange Advance Decline line (NYAD) makes a new high. In fact, given this indicator’s solid record of predicting the future market trend, it’s hard to consider that the future holds anything but higher prices in the short to intermediate term. Of course, given the general headline climate, it’s also reasonable to expect sudden short term reversals in the price trend. Accordingly, it’s important the “buy the dip” mentality remains in place. Yet, as long as the NYAD remains above its 20 and 50-day moving averages, the likelihood of a decline such as the one we saw in Q4 2018 seem low. For their own parts, the S & P 500 (SPX) and the Nasdaq 100 (NDX) indexes continued to move higher after a four day 3% decline in the week that ended on 3/15. Moreover, both indexes closed above key resistance levels – 7200 for NDX and 2800 for SPX- albeit in lower volume than I would like to have seen. 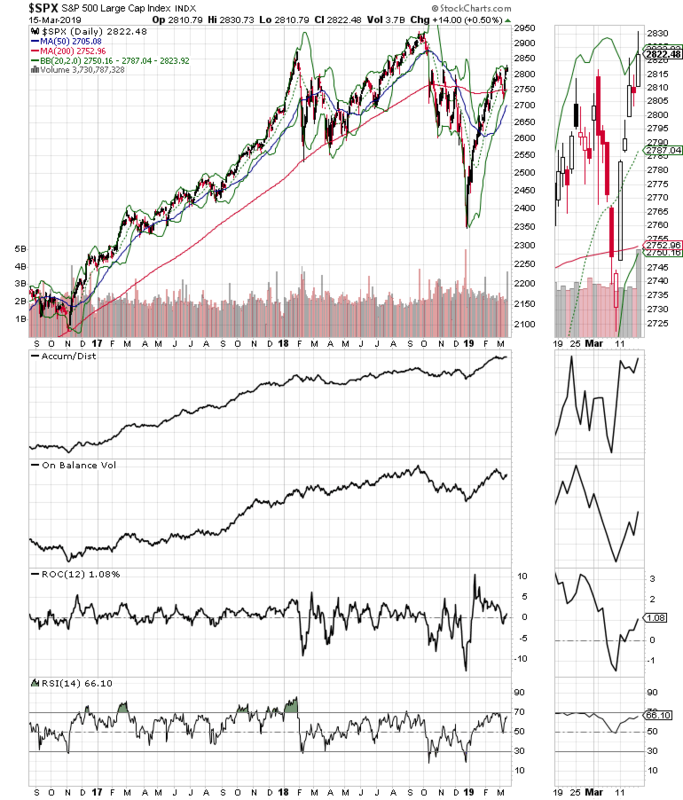 Furthermore, both indexes closed the week above their upper Bollinger Band, a sign that trading might have gotten a bit ahead of itself for the moment. So for now, it’s all about the market staying above recent support and what happens when 2900 on SPX approaches. The market bounced back from a shallow, although scary three percent pullback and is becoming slightly overbought. That means that how stocks work out their overbought status is the next big trading worry. The best scenario would be a slow and steady sideways consolidation. But there is no guarantee that this will occur, which means that we could see another three to five percent decline come on rapidly starting next week. For now, however, the 20 and 50 day moving averages have proven to be support, so they get the benefit of the doubt. Moreover, staying cool and managing each stock individual position on its own merits is the best approach to this market. If there are opportunities to short individual stocks and sectors, it’s not a bad idea to consider. Finally using options for high priced stocks will reduce risk while the opportunities for Buy-Write strategies and building positions in high yielding dividend plays is on the rise.